from Exact Change Yearbook c.1963, broadcast by Paul Blackburn on "Contemporary Poetry"
Due to a power outage, only the first 14 minutes of the reading were recorded. These recordings were originally made available to the Slought Foundation by Fred Wah. PennSound publication made with thanks to Slought and with the permission of Fred Wah and the Creeley Estate. Recording courtesy of the University of Arizona Poetry Center. These recordings were originally made available to the Slought Foundation by Fred Wah. PennSound publication made with thanks to Slought and with the permission of Fred Wah andthe Creeley Estate. On Olson, in Albuquerque, recorded 1966.
courtesy Woodberry Poetry Room, Harvard. Thanks to Bobbie Hawkins, Bill Katz, Elsa Dorfman, and Penelope Creeley for permission to make this available on PennSound. Ed. Ch. Bernstein. Courtesty Jeff Davis. Recording from North Carolina Division of Archives and History. Radio play by Robert Creeley, performed by Robert and Bobbie Creeley. Correction from Lisa Hollenbach: The recordings of "Heroes" through "The Name" were originally made for a birthday compilation tape Paul Blackburn made for Ezra Pound in honor of his 78th birthday in 1963. The tape was recorded not in New Mexico. Creeley begins the original tape (at UCSD) with a dedication to Pound--"For Ezra Pound, who's very very good to me, from Robert Creeley"--and reads these 10 poems. Original released on cassette by S Press, Dusseldorf/München, Germany. CD available for purchase from Rockdrill, a series commissioned by the Contemporary Poetics Research Centre at Birkbeck College, London. Recorded by Jacques Darras in Paris for the France Culture documentary series Albatros. Creeley discusses his life and work and reads poems, with Pierre Joris, to the improvised jazz of Steve Lacy. Produced by Jacques Taroni for Radio France. This radio series pilot, from the mid-1990s, features Robert Creeley and Charles Bernstein. It was never broadcast and no other programs were produced. Introduction to event by organizer Charles Bernstein; introduction to Creeley by UB President William Greiner; (9:04) Joseph Conte introduction to Gilbert Sorrentino followed by Sorrentino reading; (58:52) Creeley talking; (1:13:28) Creeley reads "Dogs of Auckland"
permission to make this event available on the Web. RealVideo by Anya Lewin. EPC feed. After an introduction, Creeley talks about Whitman and starts his reading with "Histoire de Florida"
"En Famille" was first published in En Famille by Robert Creeley (text) and Elsa Dorfman (photographs), Granary Books, New York, 1999. A video interview with Ted Pelton, 2002. 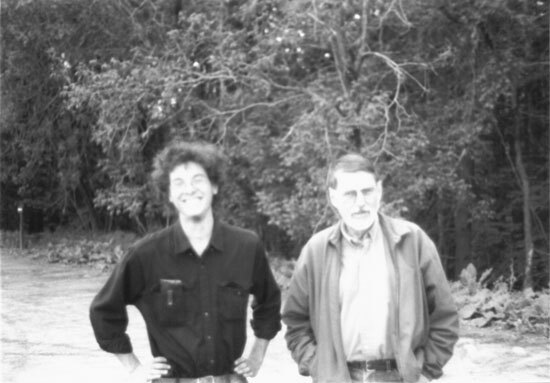 August 18, 2010: "Robert Creeley: Four New Recordings from Video"
April 8, 2009: "PoemTalk 16: Robert Creeley's 'I Know a Man'"
July 14, 2008: "Two New Recordings by Robert Creeley"
February 15, 2008: "PennSound Podcast #9 Featuring Robert Creeley"
These sound recordings are being made available for noncommercial and educational use only. All rights to this recorded material belong to the author. © 2015 The Estate of Robert Creeley. Used with permission of Robert Creeley. Distributed by PennSound.